People complain of a toothache and infection in their lower molars teeth that seem to extend up into the roots. There is usually one tooth where the pain is more focused. They usually come to see me after trying to get relief from their dentist without success. These are usually regular clients of mine that have been educated on the impact of bodywork on the health of their teeth. This one is fairly straightforward and consistently gets rid of that irritation in a back tooth. Like many of the trigger points in the TMJ musculature, this one is activated by uneven chewing or chewing on things like toothpicks and popcorn kernels. Sometimes it is caused by more laborious chewing of foods like taffy or bubble gum. This pattern is usually perpetuated by problems in nearby joints or a fragile tooth. Most of the time, this pattern occurs as a feeling of infection and sensitivity in the lower molars and bicuspids. This referral, like its counter part in the upper belly of the masseter, creates that yucky toothache feeling that feels like it is infected into the root of the tooth. 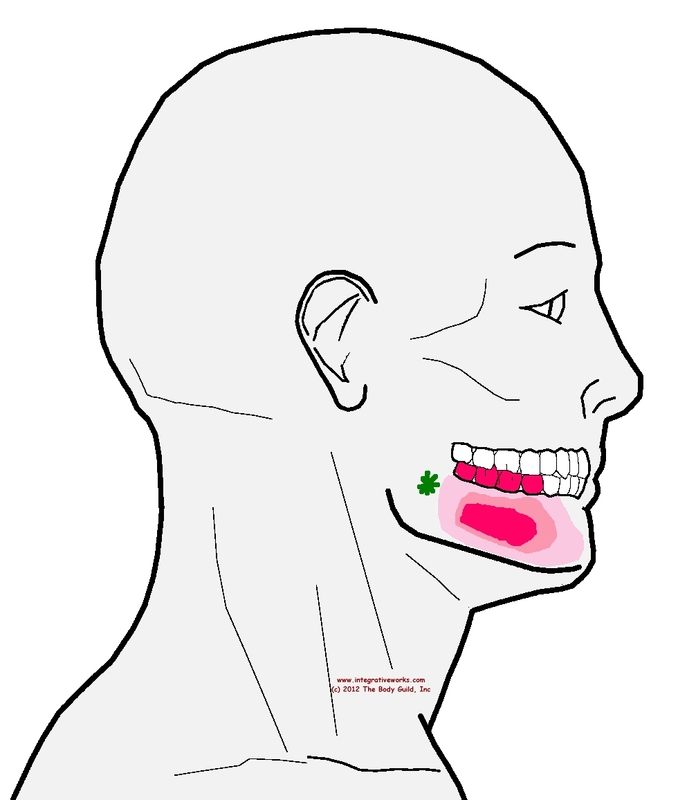 The trigger points are in the superficial masseter in middle of the muscle belly making the whole area sore. These trigger points are deep in fibers that are usually very thick and resistant to lasting release. This is seldom released with lasting relief with direct work on the trigger points. Prepping the area by releasing joints that perpetuate this tension is key to lasting relief and more comfortable treatment. A compliant client who will participate in self-care like stretching with ice/heat can facilitate a shorter course to lasting relief.